SINT MAARTEN (PHILIPSBURG) - Every spring, groups on islands all over the Caribbean celebrate the birds that live only in the region. These events are all part of the Caribbean Endemic Bird Festival, organized by BirdsCaribbean. This year, the theme of the festival is Protect Birds: Be the Solution to Plastic Pollution. On St. Martin, the Les Fruits de Mer association hosts the Endemic Animal Festival on Sunday, April 28th from 9am to noon at Amuseum Naturalis. The free festival will feature the animals that live only on St. Martin. Other parts of local nature and heritage will also be explored using the theme Survivors. Endemic Animal Festival guests can decorate a bird feeder made out of a plastic water bottle. They can also see how 5,000 years of recycling traditions on St. Martin might hold the key to a more eco-friendly future. The free event also includes fun bird activities, a poetry exhibit and much more. Caribbean Endemic Bird Festival events are held between Earth Day on April 22nd and International Biodiversity Day on May 22nd. The Endemic Animal Festival on St. Martin is Sunday, April 28th from 9am to noon at Amuseum Naturalis. To learn more about this free event, visit lesfruitsdemer.com or find Les Fruits de Mer on Facebook. Save birds by fighting plastic pollution in the Caribbean. SINT MAARTEN (PHILIPSBURG) - On Wednesday, April 17th, 2019, the Human Trafficking/Smuggling Team of KPSM (Sint Maarten Police Force), together with the assistance of the Uniform Division arrested two persons in connection with an ongoing case of human smuggling, the police announced on Thursday. After their arrests, the suspects R. H-R and Y.D.F were both brought to the Police Station in Philipsburg, where they were questioned by the detectives of the Human Trafficking/Smuggling Team and remain in custody for further investigation. The investigation against the suspect will be carried out by the Human Trafficking/Smuggling Team, which consists of members of the St. Maarten Police Force and the Royal Dutch Marechaussee. SINT MAARTEN (POND ISLAND) - University of St. Martin (USM) continues with its 2018-2019 Seminar Series as this month’s edition will focus on the topic Arts and Academia on St. Martin. Coinciding with the start of Carnival season, this Tuesday evening, the doors of USM Lecture Hall will be open to the public with presentations and dialogue on the topic Arts and Academia. “It is during the month of April, our carnival season, when St. Martiners work collectively to showcase their music, performances and visual arts in public. And so our faculty and staff thought it would be appropriate to dedicate this seminar to the Arts. Our purpose is to stimulate thinking on what role the university can play in promoting the arts. This includes music, theatre, dance, literature and visual arts,” said USM President Dr. Antonio Carmona in written statements to the press. Three local experts within the fields of performing and visual arts will be presenting their knowledge, vision and opinion on how the community can benefit from the Arts and how we can cultivate, preserve and encourage cultural production. Scheduled to speak is Ms. Clara Reyes who is the current Head of Culture Department at the Ministry of Education, culture Youth and Sports. Ms. Reyes has an extensive career and experiences in Performing Arts and Art productions. Ms. Reyes holds a MA in Fine Arts degree in Dance and Choreography; she worked as an Arts Instructor in several high schools and co-founded the National Institute of Arts and Imbali Center for Creative Movement. Ms. Reyes will be discussing among others things, the impact and value Arts has on the well-being of the community. One of the major constituents of Arts is Literature, which brings USM to invite Mr. Alex “Shujah” Reiph. Shujah, as he is lovingly known in the community, is a leading St. Martin national activist, cultural organizer, and trade unionist. He is president of the Conscious Lyrics Foundation and producer/host of the long-running Conscious Lyrics radio magazine, on 95.9 FM. He is also a founding member of the St. Martin Educational and Cultural Organization (SMECO) in 1984. In 2003, he partnered with Lasana M. Sekou and started the St. Martin Book Fair, which celebrates its 15th anniversary in 2018. When discussing Arts the conversation always leads to music, and in observance of the 50th Anniversary of Carnival on St. Maarten, the seminar will look at how local talent is developed. Scheduled presenter Edsel “Touché” Eusebius was born and raised on St. Martin, and he started his music carrier at a very young age. Being raised in a musically oriented family he was exposed to sound and performance since birth. His grandfather was the founder of a very popular folkloric band “Tanny & The Boys” that play traditional St. Maarten music. His uncles also had a steel pan orchestra, and everyone would practice in the yard where Touché lived. He would at times accompany his uncles to some of their performances and would even sing a song or two and this is where his musical journey began. Touché is a well-known bass player who played for many prominent and well known groups such as “Intwine” and “Ziggi Recado”. He also produces records and mixes albums. He has produced for numerous bands and artist such as Orange Grove, Patrick Grayham and Ziggi Recado to name a few. Touché has returned to his island of birth in 2017 to focus on helping the youth of St. Maarten achieve great things through music. “We are hoping to attract a good crowd of those genuinely interested in arts production, and those who want to know more about how the development of the university can benefit the study and practice of performance. This line of speakers should lay the basis for an interesting and fruitful dialogue”, Carmona stated. The evening will begin with words from USM lecturer and UNESCO Sint Maarten secretary General Ms. Marcelia Henry. Doors open at 6.30. SINT MAARTEN/THE NETHERLANDS – More than 100 pre-school daycare centres spread all over the Netherlands say their policy is to refuse children who have not been vaccinated, according to broadcaster NOS. Of those creches, some 25 say they have actually banned children who are not vaccinated, NOS said. The broadcaster says it is illegal to ban children who have not been vaccinated because of anti-discrimination laws. However, daycare centres can refuse to admit children if there is a serious health issue, such as a measles outbreak. ‘As owner, I do not want to be held responsible by parents if I expose their young babies to infectious diseases,’ one creche owner in Amsterdam said. The NOS report follows the news that four children under the age of four have developed measles at a crèche in The Hague, none of whom were vaccinated against the disease. The children in The Hague bring the total measles cases in the Netherlands to 13 so far this year, compared with an average annual infection rate of 10 to 20. Junior social affairs minister Tamara van Ark has set up a committee to look into the legal implications of banning non-vaccinated children from daycare, describing the issues as ‘complex’. The last measles epidemic in the Netherlands hit the Dutch Bible belt in 2013. In total, 2,600 people were diagnosed with measles and the outbreak was concentrated in families with young children who had not been vaccinated for religious reasons. One girl, who had not been vaccinated, died. The NOS contacted 3,600 daycare centres and 500 responded. Of them 105 said they banned non-vaccinated children. Meanwhile it was reported on Monday that a teacher at a secondary school in Zoetermeer had been diagnosed with a possible case of measles. The teacher, who was not named, works at the Oranje Nassau College. The school told the Telegraaf most of its pupils have been vaccinated and school activities are continuing as normal. SINT MAARTEN (PHILIPSBURG) - Since March 2019 the National Recovery Program Bureau (NRPB) has moved into its own office space located in the former Labor Affairs building at Walter J. Nisbeth Road #57. SINT MAARTEN (MULLET BAY) - In the first St. Maarten Open Golf Tournament held post-hurricane Irma, the spirit of positive continuity and perseverance was embodied by Mr. Marlin George. He turned out to be the best player in the two-day tournament held the past weekend with a cumulative score of 153. The visiting player from Antigua proved to be the sharpest and most consistent on both days. The Tournament Overall Low Net was won by David Ward from the USA with a total Low Net score of 123. The Sxm Open Tournament started with an opening reception for players and sponsors on Friday evening at the Sunset Beach Bar The first round of the tournament got underway on Saturday morning with a total of 65 players representing St. Maarten and St. Martin, a large group of golfers from Anguilla, as well as France, Colombia, Antigua, USA, Nevis, Trinidad and the Netherlands The Championship flight with 10 players all with a handicap between 0-10, consisted of players that were determined to chase the first day leaders on the second day of the tournament. Still Champion Marlin George beat them by 3 strokes. 2nd Low Gross was won by Howard Hobgood from St. Maarten. The prize of 1st Low Net was won by Stanley Samuel from St. Martin with a score of 142, 2nd Low Net was won by Jesus Rivera from Colombia. In the category Men’s 1st flight for players with a handicap between 11 and 18, Marc Grenouilleau from St. Martin came out on top with a score of 163 Low Gross, Andy Holmes took first Low Net with a score of 140. In the Men’s 2nd Flight for players with a handicap between 18 and 36, first Low Gross was won by Andy Wescott from St. Maarten with a score of 183, first Low Net went to Louis Assier de Pompignan from St. Martin with a score of 145. In a strong field of female players, the prize for Low Gross in the Ladies category went to Marie Gibbons from the USA with a score of 173. Low Net was won by Oli Tinitali from St. Maarten with a score of 151. Jean Paul Clerc from St. Martin shot 164 to win the Low Gross in the category Senior’s 1st Flight for players over 50 years old and with a handicap up to 18, while Tony Lake took 1st Low Net in this category with a score of 135. In the Senior’s 2nd Flight for players with a handicap between 19 and 36, first Low Gross was won by Lester Samuel from Anguilla with a score of 184, first Low Net went to Glenford Gumbs from Anguilla with a score of 144. This year again a large number of players participated in the Super Seniors category (for golfers over 60). Therefore, this category was split up for players with a handicap up to 18 and a category with handicaps from 19 to 36. In the ‘Super Senior’s 1st Flight’, Keith Graham from St. Maarten won Low Gross with a score of 171 and Low Net was won by Tony Burn from St. Maarten with a score of 141. The category ‘Super Seniors 2nd Flight’ was won by David Ward from St. Maarten with a score of 193 Low Gross, Hilroy Humphreys from Antigua won Low Net in this category with a score of 155. After the second round on Sunday a recognition party was held at Tortuga Beach Bar and Lounge, where Awards were given to the numerous winners and auctions were held as well as raffles. The St. Maarten Golf Association SMGA was able to organize this top ranked tournament due to the great partnership with Mullet Bay Resort & Golf Course, combined with the relentless efforts from its members, volunteers and the tremendous support it received from both the local and international business community. Proceeds from the event will benefit pre-selected community organizations supporting sports for the youth of St. Maarten. 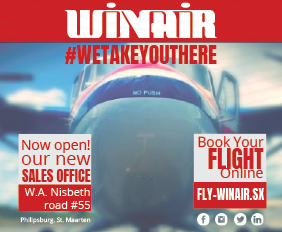 Winair Airlines, Winward Island Bank, WYSO. and non-members and donates most of its proceeds that achieved through membership fees and during events like the St. Maarten Open to multiple community organizations on the island. SINT MAARTEN (POND ISLAND) - TelEm Group are making a limited edition of $10 TelCell Night of the Hit Makers phone cards available to the general public and card collectors in a new campaign launched Thursday. “We are having fun, our staff are having fun and we want our subscribers, visitors to the island, and the public generally to also have fun with us as we make this one Carnival that we will remember for a long time,” said the Manager, Marketing and Sales. GREAT BAY, Sint Maarten (DCOMM) – Women are being called upon to register and sign-up as soon as possible for the next free breast abnormalities and health screening exam/survey which is set for this Saturday, April 13th. The screening is carried out on scheduled Saturdays between 8.30am to 3.00pm. The examination is a collaborative effort by the Collective Preventive Services (CPS), a department in the Ministry of Public Health, Social Development and Labour (Ministry VSA), the Positive Foundation, and the American University of the Caribbean (AUC), the latter, is lead research agency. An overall health assessment will be carried out that includes taking your height, weight to calculate Body Mass Index; blood pressure, heart rate; visual acuity, blood glucose and cholesterol. Those in attendance will also receive a presentation about the risk factors for breast cancer, including information regarding modifiable risk factors that can help to reduce the overall breast cancer risk; assessment of individual breast cancer risk via Gail model, and the distribution of breast cancer awareness brochures to take home. The screenings target population are women 18+ years of age. The screenings take place at the Vineyard Office Park Building in Philipsburg at the CPS Offices. Breast abnormalities represent a large spectrum of disorders including benign, congenital, hormonal and malignancies such as breast cancer. Major risk factors for breast cancer in women are age, genetic predisposition and hormonal imbalance. Breast density is also a significant factor, especially in women 40 to 49 years of age. The purpose of the study is to gain insight into the types of breast abnormalities and risk factors in women 18 and above with no age cap in Sint Maarten. SINT MAARTEN (PHILIPSBURG) - In the ‘Draco’ investigation, two house searches were conducted in Sint Maarten by the Anti-corruption Taskforce (TBO) on Tuesday, April 9 and Wednesday, April 10, 2019 under supervision of the Examining Judge. The searches were conducted in a home in Cupecoy and at an accounting firm in Cole Bay, the Public Prosecution Service (OM)/TBO said on Wednesday. In the same investigation, bank accounts, vehicles, expensive jewelry, real estate and firearms were seized simultaneously in Sint Maarten and in Romania. There were also two-house searches in Romania at the request of the Public Prosecutor’s Office. The Public Prosecutor’s Office and TBO have worked closely with the Public Prosecutor’s Office in Romania and the National Anti-Corruption Service (DNA) of that country. There is a suspicion that suspects in the ‘Draco’ investigation have diverted criminal assets from Sint Maarten to Romania, among other things, by investing in real estate there. On 10 April 2019, L.J.J. (38, born in Sint Maarten) was also arrested in Sint Maarten. He is suspected of fraud, forgery and tax fraud. The arrested suspect has been detained and will be brought before the examining judge this week. ‘Draco’ is the result of the ‘Emerald’ investigation, which includes investigations into fraud at Port Sint Maarten by means of false invoices. This has caused the Port disadvantages of many millions of dollars, the OM/TBO media statement says.